Ever since we’ve had a lemon tree, and more lemons than we knew what to do with, I’ve been making limoncello–a lemon liqueur made from steeping the zest of fresh lemons in grain alcohol, then mixed with simple syrup and more alcohol. It hails originally from Sorrento in Southern Italy. 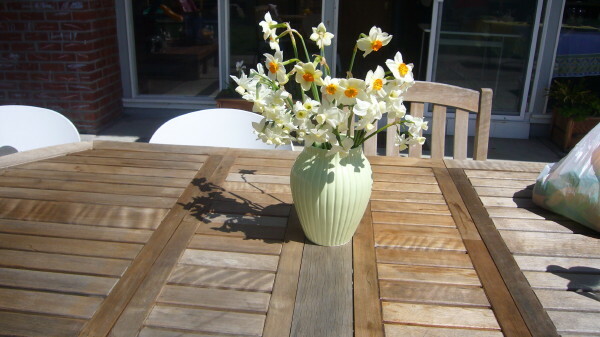 It’s strong and fragrant and a gorgeous bright yellow. Served ice cold in warm weather, it’s just about one of the best things you’ll ever drink. 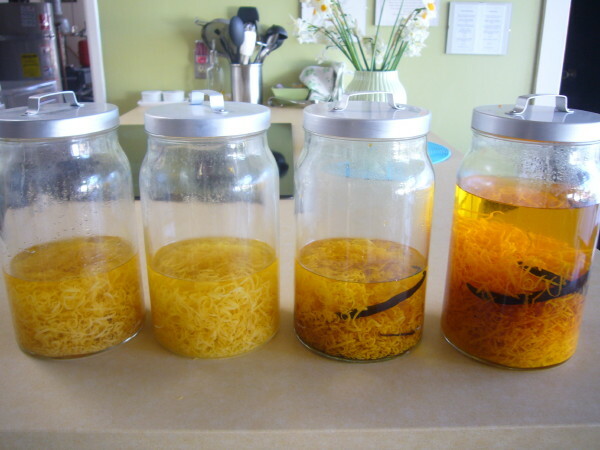 When we bought our house, it came with an excellent old orange tree, so orangecello was added to my spring brewing. ThenI discovered crema di limoncello and crema di orangecello (in which sweetened milk is added to the steeping zest; think: creamsicle for adults) and my house in spring began to look a bit like a small artisinal distillery. The word spread. For the party, I supplied the recipe and know how, as many oranges as my friends could pick off my tree, the last of my previous year’s limoncello for tasting, some prosecco for mixing and drinking straight, and my friends brought their lemons and alcohol and a dish to share and we zested and juice and ate and drank all afternoon. It’s an excellent party: easy, fun, productive. This year my friends branched out: some started a batch of crema, some added vanilla beans (which I always do to my cremas and meyer lemon batches), they use different vodkas, etc. There’s basically a recipe for every family, which is how it should be. 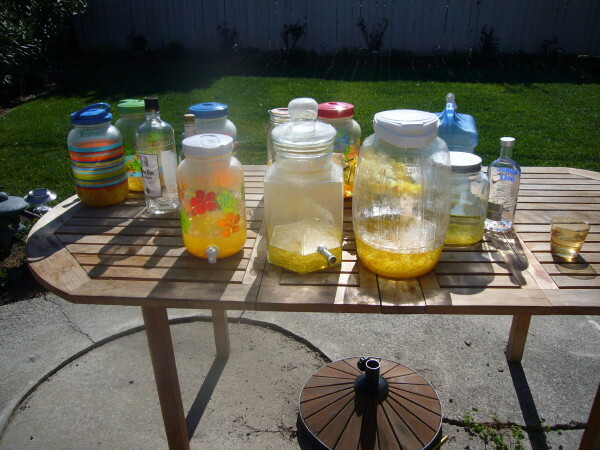 I set up one zesting station, with 6 zesters, where everyone took turns zesting into their large glass jars. 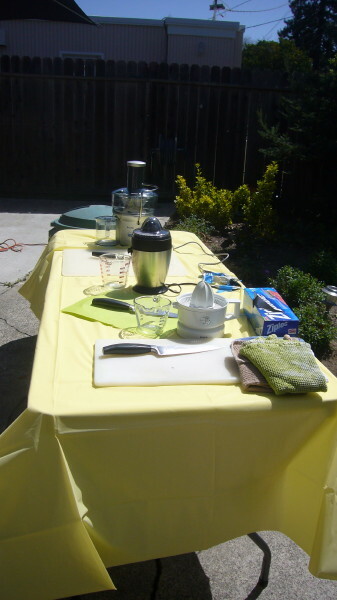 At another station, set up with 3 juicers (2 were mine, one brought by a friend), we juiced the zested citrus and brought the juice home in freezer ziplock bags, which I provided. I freeze my lemon juice in ice cube trays, then the kids can mix it with simple syrup and bubbly (or plain) water all summer long for fresh lemonade. Call it the recessionary party, but we’ve been doing it this way for years. I also laminate the recipe cards, with the recipe on one side and serving suggestions on the other, which is what I’ve reproduced below. It’s not too late for you to brew. Especially with friends. Note: Don’t be afraid of the Everclear if you can find it. It’s stronger than regular vodka and has less flavor of it’s own. This means it extracts more of the flavor and essential oils from the zest and imparts less of its own taste to the finished product. It also doesn’t get slushy in the freezer. Organic, unsprayed fruit is essential. You don’t want to be drinking chemicals. Step One: Wash the lemons with a vegetable brush and hot water to remove any residue; pat the lemons dry. In a large glass jar (1-gallon jar), add one bottle of vodka. Carefully zest the lemons with a zester or vegetable peeler so there is no white pith on the peel. Add the lemon zest to the vodka as it is zested. NOTE: Use only the outer part of the rind. The pith, the white part underneath the rind, is too bitter and would spoil your limoncello. Cover the jar and let sit at room temperature for at least 10 days and up to 40 days in a cool dark place. The longer it rests, the better the taste will be. (You can shake or stir a little every few days, if you like.) 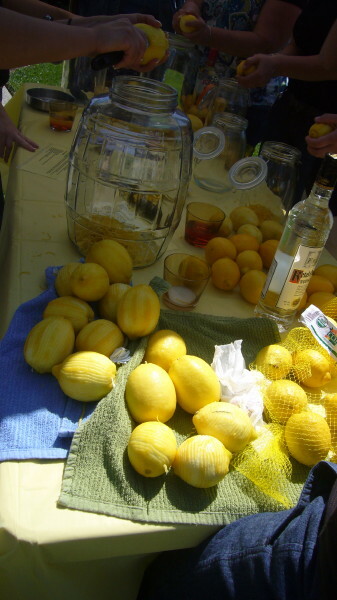 As the limoncello sits, the vodka will slowly take on the flavor and rich yellow color of the lemon zest. When the color is no longer deepening and the rinds look whitish, it is definitely done. Step Two: In a large saucepan, combine the sugar and water; cook until dissolved, or until thickened if you want a thicker, sweeter drink, approximately 5 to 7 minutes. Let the syrup cool, then add it to the Limoncello mixture from Step One. Add the additional bottle of vodka. Allow to rest for another 10 to 40 days. Step Three: After the rest period, strain the liquid through a cheese cloth or coffee filter and bottle: discard the lemon zest. Keep in the freezer until ready to serve. · Try Crema di Limoncello/Orangecello, a creamy version of this drink: steep 2 vanilla beans in 750 ml. warm milk, add sugar and stir until dissolved. Cool completely. Substitute this milk mixture for the simple syrup. Or, steep the zest right with the vanilla beans, then add the milk/sugar mixture. Don’t use the second bottle of alcohol. Many other variations for this recipe for this are available online. When I make my crema, I just split, scrape and steep one vanilla bean with the first bottle of alcohol and zest. I love the flecks of vanilla in my drink.